Beautiful nail designs don't have to be complicated. From rhinestone accents to simple freehand art, there are many easy ways to add distinction to nails. French nails provide a beautiful background for simple nail designs. Try adding a line of color or glitter to your tips. Although this look appears to be difficult to achieve, it's actually quite simple. You'll need two bottles of nail polish: one in your chosen base color and one of shatter or crackle paint. Carefully apply your base coat and let it dry fully. Then, apply your shatter polish according to the manufacturer's directions. After the polish has dried and "cracked," you'll have a truly unique look. Look for shatter polish in a variety of colors by OPI. You can find similar polish by other companies as well. Thanks to nail decals, you can easily add flowers, birds, rhinestones, and more to your manicures. There is a wide range of quality in decals, so you'll have to experiment to find the ones that work for you. For the best and longest lasting results, follow the application and care instructions carefully. It used to be that you had to go to a salon for something as detailed as animal prints, but now you can get the look at home. Sally Hansen's Salon Effects Real Nail Polish Strips are available in leopard, zebra, and bird designs, as well as many geometric effects. With this product, you peel, apply, file, and go. You can also find decals in a variety of animal designs. 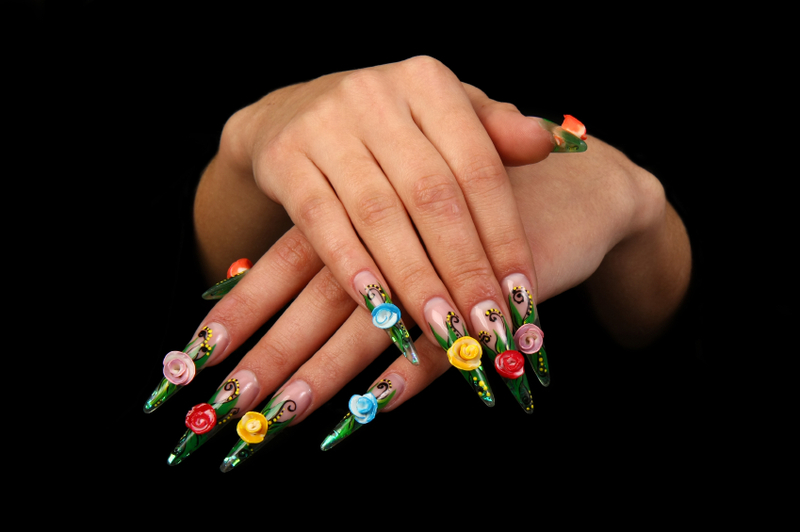 With nail pens, your nail art can be as elaborate or as simple as you like. Start with a base color, clear polish, or a French manicure and then draw to your heart's content. Even a simple line with dots looks beautiful on nicely groomed nails. Sparkly rhinestones, crystals, and faux gems add a bit of glitz to your nails. You can apply individual jewels to your nails or you can use multiple stones to create butterflies, hearts, and other designs. This simple touch adds a whole new element to your nails. Pick two complentary, matching, or coordinating colors and divide your nails. This look can be as bold or as subtle as you desire, depending on the colors you select. This style requires a steady hand, but glitter or jewel accents along the divide will help disguise any mistakes. French manicures are simple designs as is, but you can use different colors to create unusual looks. Try everything from pretty pastels to bold neons to find the style that's right for you. Crystals, rhinestones, and other design elements further enhance the look. These are just a few of the ways you can dress up French nails.